Every Sunday we welcome coarse fishing all-rounder Colin Mitchell. For many years Colin was a senior Angler’s Mail magazine staff man and he has enjoyed a long, interesting journalism career. He understands match fishing, pleasure fishing, carp fishing – the lot. Please share this blog on Facebook and Twitter by clicking the icons above. MOST top anglers have something in common – they have great memories about past fishing exploits. They remember tiny rig adjustments, feeding patterns and other things that influenced past fishing trips. These are all brought into play if their Plan A doesn’t work on the current angling expedition. Easy peasy you say, I can do that. Can you, really? Well you may have a great memory but can you pull on past happenings when you need to improve your fishing? Or, just as important, are you able to do something else that successful anglers practice – come up with a new Plan A? How many times have you sat at a venue and struggled to catch yet stuck with your tried and tested methods? How often have you failed to try something just a little bit different in the hope that you can get an edge over the fish? I will hazard a guess that many of you don’t veer off the straight and narrow and love to stick to things you have found worked in the past – even if they don’t work on one particular day. Don’t wear blinkers and there is a fair bet you will catch more. Last week I heard an angler bleating that he had failed to catch on pellet – he’d actually failed to catch very well at all. I’ve always felt pellets are not always successful when the weather turns cold and on this venue, where I caught on various pellets during the summer, I turned my attentions to bread. And at another local venue, where I had been tipped off there were some huge perch, I decided that a different approach was also needed. Worms would take small perch and also virtually every other species in the venue. I did try here last winter with prawn but caught big roach. That didn’t put me off this time as I thought with overcast skies and the right temperature the perch would have a go. I didn’t want to feed too much as the weather had turned cold and didn’t want to try the usual perchers trick of feeding maggots to lure in other species that perch might follow. So out came the worm chopping scissors to mash up half a dozen prawns that were cupped into a likely looking feature peg down the edge. Another six went to the other side of my swim. Both places were left for an hour as I caught a few roach on maggot fished at nine metres. First drop into my inside swim and I had a lovely perch of around 2lb 8oz. More perch followed, including a good fish from my second inside swim. I’m also of the belief – unlike many – that groundbait still works well in the winter. It’s just a case of feeding a bit more cautiously until you are sure, and probably feeding it a bit drier or sloppier if you can get away with it. The cloud of feed is a great attractant and darker groundbaits on the bottom give fish confidence to feed without being spotted by predators – which would happened if they swam over a lighter groundbait,. I’ve also found a neat trick here is to sprinkle in a few crumbs of liquidised bread. Not too much though as you don’t want to over-feed fish that are feeding carefully. Worms are nearly always a catcher at this time of the year and it’s not often that chopped worms fail to work. The trick here is to feed a fair few chopped up – say ten to 12 for starters and don’t top up until you stop getting bites. If you can feed them into an area of your swim that can be left for at least an hour – maybe even more – that’s even better and there is a good chance you will catch first put in. Don’t be a slave to putting whole worms on the hook either. Try different sizes and pieces. Alternate heads and tails, two bits, small worms, big ones…you will be amazed at how changing suddenly brings a bite from a swim that has died. COLIN MITCHELL WILL BE BACK WITH HIS POPULAR PLEASURE FISHING BLOG NEXT SUNDAY. 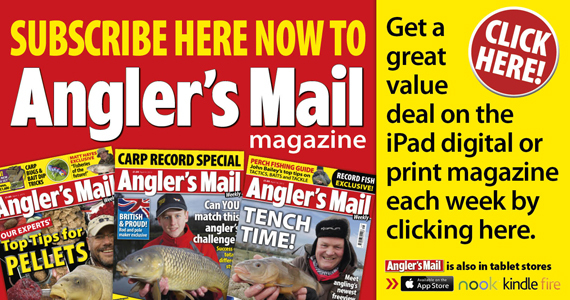 Be sure to get this week’s brilliant issue of Angler’s Mail, on sale Tuesday, November 26.